In this new atmospheric opus, pioneering composer and artist of the transcendent Steve Roach explores the confluence of texture, tonality, sonic abstraction, continuity and space with a set of six interconnected paintings in motion. The spirituality of sound is central within these emotional landscapes with infinite horizons. In the way a visual artist mixes their colors and utilizes the natural light-infused ambience of the studio to support the piece as it evolves, Roach initiated these mystical sonic states under the influence of the late hours at night. Within the shroud of natural darkness and a few low level lights in the studio supporting the creative flow, these paintings in the dark were born. 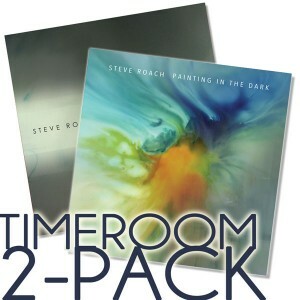 Steve often finds parallels in his creative process to that of a painter or sculptor, and aspired in this direction before discovering electronic music as his main form of artist expression. Painting In The Dark presents an aesthetic that is unique to Roach’s work, embracing the mystery and wonder of sound as a constant evolving companion to the ongoing bloom of consciousness. A dark-ambient magma flow of ultra deep harmonic immersion. This is the next chapter in the evolution of Steve’s rapturous long-form zone-worlds. Moving beyond the drone form, Fade to Gray is a consciousness-activating, 74-minute space of slowly churning, shifting harmonic alchemy. Subterranean sonics emerge rich with visual correlations, deep below the Earth’s surface, monitored and amplified into an above-ground listening space. Steve approached Fade to Gray as if working on a large scale canvas or as a sculptor, shaping etheric material into sonic form through the tactile process offered by his analog hardware-based studio. Beyond the immersive environment experience, the music also functions on several levels. At low volume and infinite playback, Fade to Gray is highly effective for hypnogogic travel and sleep. At a higher volume, on a sound system that supports the emotional impact of full resolution playback, the sensation of a surreal, symphonic movement is magnified, expressing texture, mood, and emotion at a cellular level.